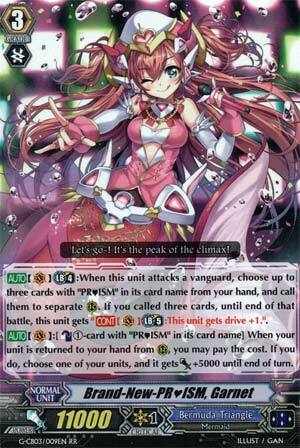 [AUTO](VC) Limit Break 4:When this unit attacks a vanguard, choose up to three cards with "PR♥ISM" in its card name from your hand, and call them to separate (RC). If you called three cards, until end of that battle, this unit gets "[CONT](VC) Limit Break 5:This unit gets drive +1.". [AUTO](VC):[Counter Blast (1)-card with "PR♥ISM" in its card name] When your unit is returned to your hand from (RC), you may pay the cost. If you do, choose one of your units, and it gets [Power]+5000 until end of turn. Closing the week is Garnet (and no I'm not making a Steven Universe reference, screw you). Garnet's Limit Break ability activates on attack. You call up to 3 PRISMs from the hand, and if you call all 3, she gains an Ultimate Break skill to give herself +1 Drive Check. Her other skill activates by Especial Counterblasting 1 when a rear-guard you control is returned to your hand. One other rear-guard gains 5k until end of turn. Sadly not compatible with Doxic as Doxic cannot target LB4 skills that grant LB5 skills. That aside, she's supposed to be combined with Vert for some shenanigans, but then again so is Labrador. Which one do I prefer? Labrador. Although her second skill will pretty much never be used unlike Garnet, her LB is nowhere near as tedious to pull off fully and with the LB remover, has considerably more merit. Weaker power for a +1 doesn't outweigh the pressure through Labrador. Use only if you actually can't find Labrador. Either way if Vert isn't your first Vanguard things are only going to get trickier but at least Labrador has something going for it early. While three drive checks are nice on a non-Stride, Garnet won't gain any extra power except by breakriding and sacking triggers, and waiting till LB5 is a bit too situational. You don't want to purposely put your back against the wall when you could be using better guarding habits. But when the stars align and you breakride Garnet over G3 Vert after swinging with G4 Vert, Garnet is gonna be a pain. Of course, it could be late game, everyone's almost spent on resources, and your opponent only has enough for a 2-pass against your vanguard when you have 3 drive checks. For the new kid on the block, there actually isn't much to say about her other than "situational." If you bother to run her at all, run 2 to actually have a chance at the combo. Also, don't run LB5 enablers. Unlike your Grade 1 space, your Grade 2 space in PRISMS is tight.